It has been our philosophy for over thirty years to carry nursery stock that is adapted to our unique climatic conditions here in the High Plains. Horticulture here is challenging and we are continually looking for varieties that are not just time tested but those that are unique and under-used in our area. We trial and search for new varieties that were developed or found in climates similar to ours. In many cases we have found native plants or selections of local plants that are superior to those on the market for customer's landscapes. The Plantsmyth offers a wide variety of your favorite annual flowers along with those that are not so familiar. From ageratum to zinnia, we will have something for any location or situation in your yard or garden. All of our plants are grown in our greenhouses either from seed or plugs to give our customers the finest quality flowers for their gardens. If you're looking for hanging baskets or containers for your patio, porch or deck, you will find just the right combination to accent your outdoor living spaces. Our hanging baskets range in size from 10" to 20" in combinations suitable for either sun or shade. If you have your own special basket or container, our staff can help you select the right plants or even do the planting for you. 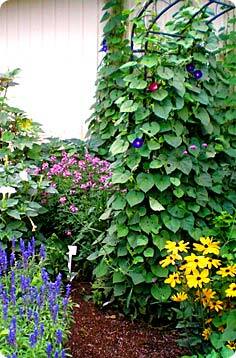 Perennials provide masses of colorful blooms and beautiful foliage year after year. Once established, many require less water than your lawn and require only occasional pruning and deadheading. Whether your location is sunny or shady, has heavy or rocky soil, is dry or wet or maybe has a deer problem, our staff can help you select varieties that are just right for your unique situation and help add color and texture to your landscape in all seasons. Add color to your gardens and landscapes with perennials from The Plantsmyth. The Plantsmyth carries only roses that are fully hardy in our area. All roses are grown on their own rootstock and are easy to care for, requiring no added protection over the winter and are hardy to zones 3-4. Shrub Roses These hardy roses are either non-recurrent(blooms once), recurrent(big bloom period, followed by short rest, then another bloom until frost), and ever-blooming. 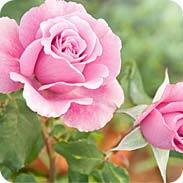 These roses can, at maturity, range from small 2' plants to large shrubs. Shrub Roses come from a wide origin with many of our varieties from the Canadian Explorer and Parkland Services. Climbers These roses vary from tall self-supporting shrubs to flexible-caned plants which can be trained to grace a fence, wall or pillar. 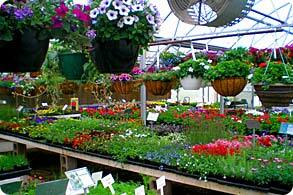 We grow a wide selection of vegetable and herb plants. Among these are heirloom varieties as well as those time-tested hybrids. 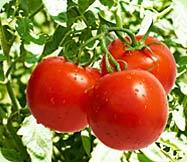 Try The Plantsmyth heirloom tomatoes this year and find out what a real tomato tastes like. Heirloom varieties are prized for their taste and appearance. They are not seen as often in grocery stores because they weren't developed for mass production, shipping or storage. The popularity of herb gardening grows every year. Taste the difference in fresh herbs	grown in your own garden or container!